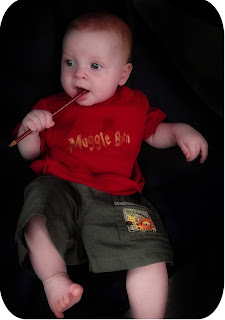 ' HP Day 4: Muggle Born - Sisters, What! I saw this Pin on Pinterest and just had to make one for our little one. I used the original Harry Potter font which you can download here. In which everyone should have in their font collection...it is a must. As well, this shirt is a must for any baby. After you determine how big you want it, print out and trace on to freezer paper (you want shiny part down). Then , using an exacto knife, cut it out (you can use one of those fancy machines like a cricut or silhouette...one day I'll get one). lay it shiny side down and iron onto shirt. Then apply your permanent fabric paint. Let it dry and then peel off the freezer paper.